1.Wash hands often to help prevent the spread of germs. It’s flu season. Wash your hands with soap and clean running water for at least 20 seconds. 2.Manage stress. Give yourself a break if you feel stressed out, overwhelmed, and out of control. Some of the best ways to manage stress are to find support, connect socially, and get plenty of sleep. Bundle up to stay dry and warm. Wear appropriate outdoor clothing: light, warm layers, gloves, hats, scarves, and waterproof boots. At home, work, and on the road, be prepared and prevent injuries too. Be smoke-free. Avoid smoking and second-hand smoke. Smokers have greater health risks because of their tobacco use, but non-smokers also are at risk when exposed to tobacco smoke. Get your vaccinations, which help prevent various diseases and save lives. Everyone 6 months and older should get a flu vaccine each year. Besides the flu vaccine, adults should get other vaccines too. Prepare food safely. Remember these simple steps: Wash hands and surfaces often, avoid cross-contamination, and cook foods to proper temperatures and refrigerate them promptly. Eat healthy, stay active. Eat fruits and vegetables, which pack nutrients and help lower the risk for certain diseases. Limit your portion sizes and foods high in fat, salt, and sugar. Also, be active for at least 2½ hours a week and help kids and teens be active for at least 1 hour a day. Cold temperatures can cause health problems. 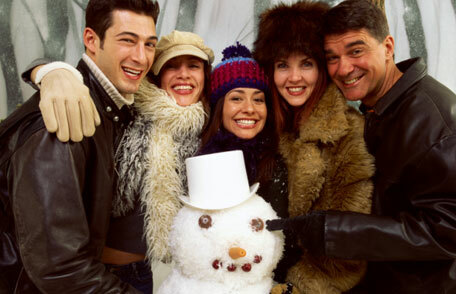 Remember to protect you and your family this season by dressing in layers of light, warm clothing.